Peace Corps Online: September 8, 2004: Headlines: COS - Sierra Leone: Film: Documentaries: Television: Black Issues: Police: Boston Globe: For Sierra Leone RPCV Alrick Brown, 28, one of the show's four students, going to film school wasn't just a shot at the big time but a way to save his life. Brown's film, "The Adventures of Supernigger," is an allegory about the 1999 shooting death of Amadou Diallo, the unarmed West African immigrant who was shot 41 times by New York Police Department officers. September 8, 2004: Headlines: COS - Sierra Leone: Film: Documentaries: Television: Black Issues: Police: Boston Globe: For Sierra Leone RPCV Alrick Brown, 28, one of the show's four students, going to film school wasn't just a shot at the big time but a way to save his life. Brown's film, "The Adventures of Supernigger," is an allegory about the 1999 shooting death of Amadou Diallo, the unarmed West African immigrant who was shot 41 times by New York Police Department officers. Peace Corps Online: Directory: Sierra Leone: Peace Corps Sierra Leone : The Peace Corps in Sierra Leone: September 8, 2004: Headlines: COS - Sierra Leone: Film: Documentaries: Television: Black Issues: Police: Boston Globe: For Sierra Leone RPCV Alrick Brown, 28, one of the show's four students, going to film school wasn't just a shot at the big time but a way to save his life. Brown's film, "The Adventures of Supernigger," is an allegory about the 1999 shooting death of Amadou Diallo, the unarmed West African immigrant who was shot 41 times by New York Police Department officers. 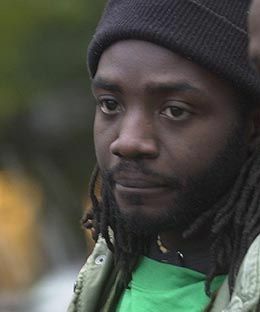 For Sierra Leone RPCV Alrick Brown, 28, one of the show's four students, going to film school wasn't just a shot at the big time but a way to save his life. Brown's film, "The Adventures of Supernigger," is an allegory about the 1999 shooting death of Amadou Diallo, the unarmed West African immigrant who was shot 41 times by New York Police Department officers. Pursuing a degree from New York University's prestigious film school can open up vast possibilities: acclaim as a director, success as a writer, or a year in lockup on Rikers Island. Nanette Burstein knows something about all three. fund-raiser whose biggest donation coup is $20 from Henry "the Fonz" Winkler. Burstein, an NYU film school alumna, has never spent time on Rikers but the experience of a classmate who did showed her that film school could make compelling reality TV. The classmate in question realized the footage he was shooting for his film project was unusable. In a drunken rage, he pushed his girlfriend, who fell down some stairs and broke her spine. He later was sent to Rikers on assault charges. "There's so many mistakes that can happen, and there are so many stakes that are very high," Burstein said. "Most people have given up other careers to do this, and feel it's their one shot in life." For Alrick Brown, 28, one of the show's four students, going to film school wasn't just a shot at the big time but a way to save his life. Brown's film, "The Adventures of Supernigger," is an allegory about the 1999 shooting death of Amadou Diallo, the unarmed West African immigrant who was shot 41 times by New York Police Department officers. For Brown, the incident hit home in two ways. He said he's been hassled by police and had a gun pointed in his face. When Brown was 4, his father, a building engineer on a construction project in Kingston, Jamaica, was shot multiple times and killed in the course of a robbery at the job site. On the show, Brown remains surprisingly confident and focused despite the obstacles he faces. Seeing how stressful the process of putting together a film is -- raising money, auditioning actors, finding a crew -- you wonder why anyone would go through the added pressure of having their every mistake caught on tape. 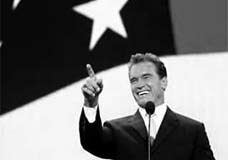 In an interview, Brown, whose favorite films range from "North by Northwest" to "Point Break," said he wasn't fazed by having cameras follow him. "I would've been doing the same thing had they been there or not," he said. "The process of filmmaking is so rigorous and so demanding. It's such a crunch time schedule that I was busy when they were filming me." All the students are in each episode. The program moves from one to another, showing not only their progress on their own projects, but how they're doing in relation to their peers. Burstein said the plan, for now, is to show the students' films on the Independent Film Channel once the program completes its run. Students would also be able to submit their films to festivals, but some, including Sundance, won't accept films that have already been broadcast. The fact there's no guaranteed big break for the students sets "Film School" apart from another reality show on filmmaking, "Project Greenlight." Launched in 2000, "Project Greenlight" is the brainchild of Matt Damon and Ben Affleck. The show's first season featured a screenwriting contest where the winner got $1 million to make his film, which was screened at the Sundance Film Festival. In its next season, the show added a directing contest, where the winner's film was based on the screenwriting contest winner's script. The movie was then given a theatrical release. But the films produced through the show have failed to generate as much buzz as the show itself. "The Battle of Shaker Heights" and "Stolen Summer" were box office flops. After two seasons on HBO, "Project Greenlight" has moved to Bravo. And proving that Oscar winners aren't immune from studio pressure, Affleck and Damon have reportedly been told to choose a film with more commercial appeal than their previous "Project Greenlight" picks. While "Film School" captures the students' struggles to make their films, it also shows what they have to do just to stay in school. NYU gets more than 1,000 applicants a year to fill 36 openings, professor John Tintori says on the show. Tuition costs $40,000, and on top of that students have to finance their films. In "Film School," there aren't any trust-fund babies (or anyone selling their eggs to infertile couples, as one real-life NYU film school student wrote about doing a few years ago). The students here get by with loans, financial help from the department, and maxing out their credit cards.